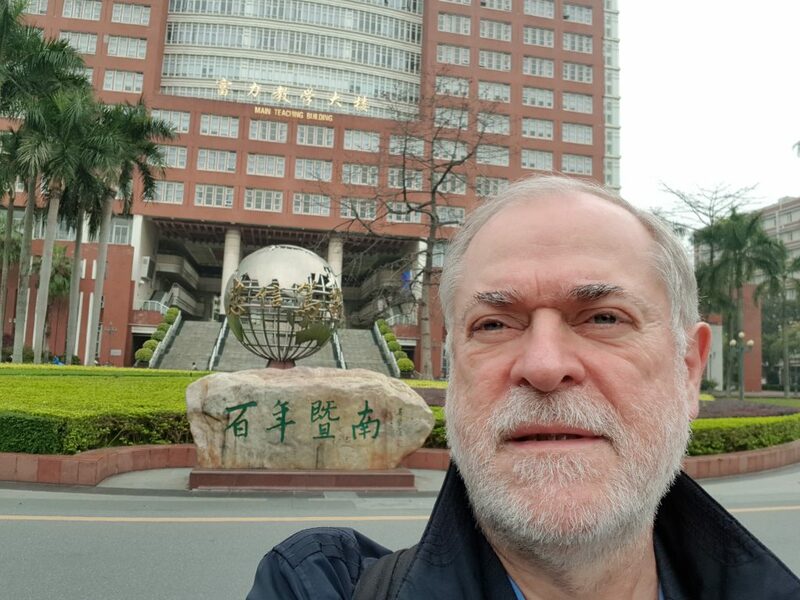 Arriving from Kuala Lumpur, where he had spent time as a Visiting Professor at the University of Malaya, GLO President Klaus F. Zimmermann arrived on March 17 in Guangzhou, China, to work a full week at the Institute for Economic and Social Research (IESR), Jinan University. Jinan University (JNU) was founded in 1906 by the Qing government in Nanjing as the first university in China to enroll overseas Chinese students. Now, it is the top university in mainland China for international students and it has fully devoted itself to creating a culture of openness, diversity and creativity among its faculty and students. The Institute for Economic and Social Research (IESR) was created in December 2015 by appointing Yangtze River Scholar Professor Shuaizhang Feng appointed as the first Dean. The mission of IESR is to advance policy-oriented economic and social research addressing the most relevant challenges of the modern China. 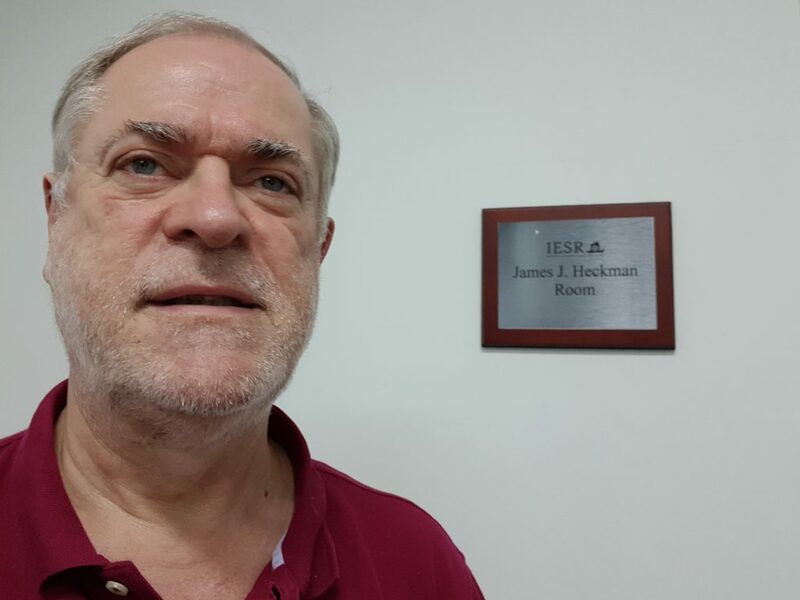 Within a short time, IESR has gained a strong faculty of significant researchers and a global reputation of excellence. 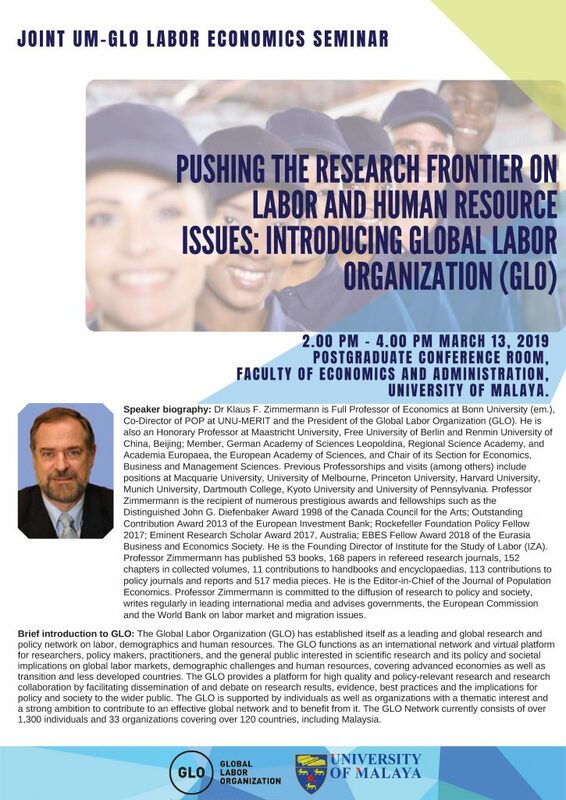 IESR has been an early supporter of the Global Labor Organization (GLO) and Dean and Professor Shuaizhang Feng is a GLO Fellow of the first hour. 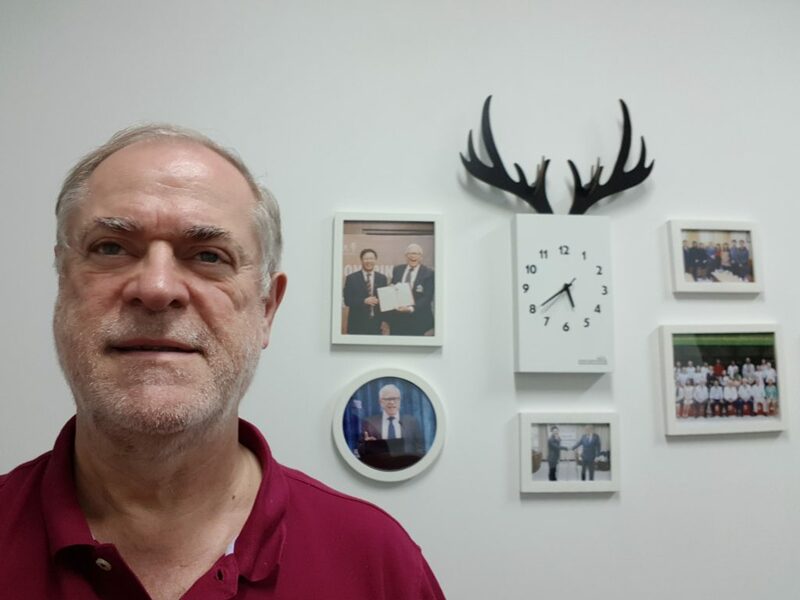 During his second visit to IESR, Klaus F. Zimmermann has met again with many IESR researchers to discuss their latest research. Shuaizhang Feng was also just appointed Editor of the Journal of Population Economics published by Springer Nature. 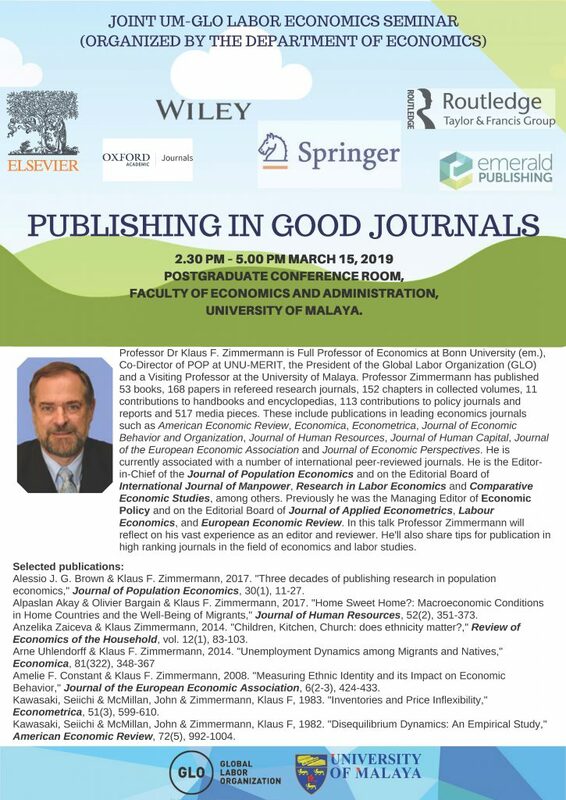 The Journal, the leader of the academic field of Population Economics, is directed by Zimmermann, who is the Editor-in-Chief. 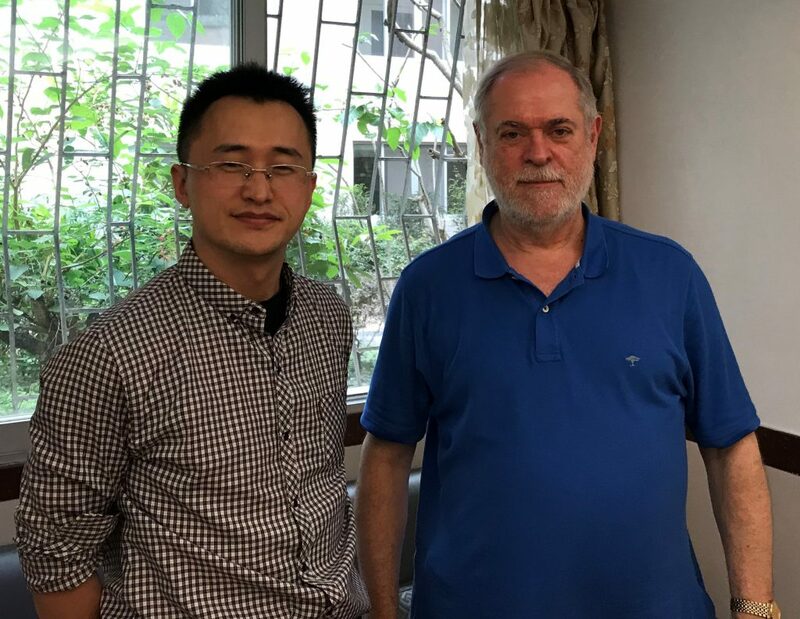 Both Feng and Zimmermann had various talks about the further collaborations to strenghten IESR, GLO and the Journal of Population Economics. Arriving at the Jinan University entry gate. Working from the Jim Heckman room…. Discussions with another visitor: Professor Wenkai Sun, Labor Economist of the Renmin University of China, Beijing, and GLO Fellow. Farewell Kuala Lumpur: Thanks for a great visit! GLO President has left Malaysia and reached Guangzhou in China. 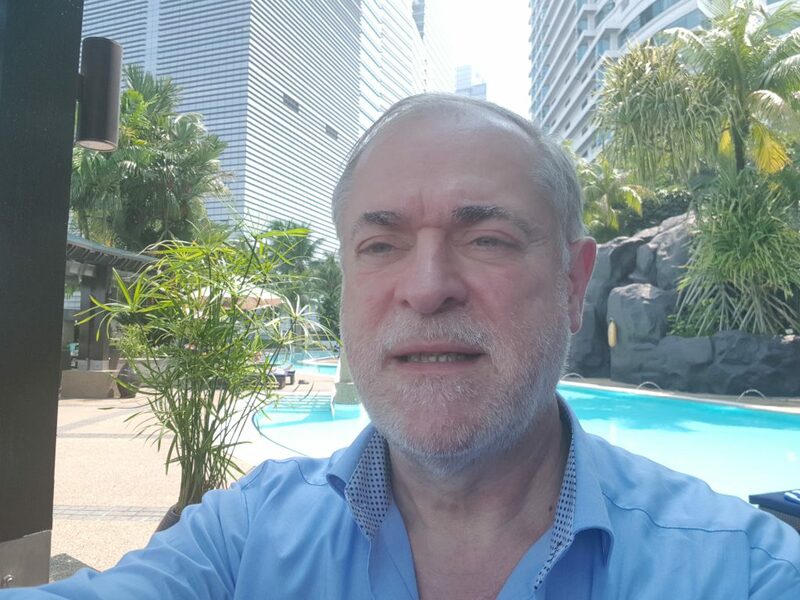 After visiting Malaysia for one week with a very intensive travel and lecture program, it is time to reflect, be grateful for the wonderful treatment and the very many fruitful interactions, and move on …. to China. 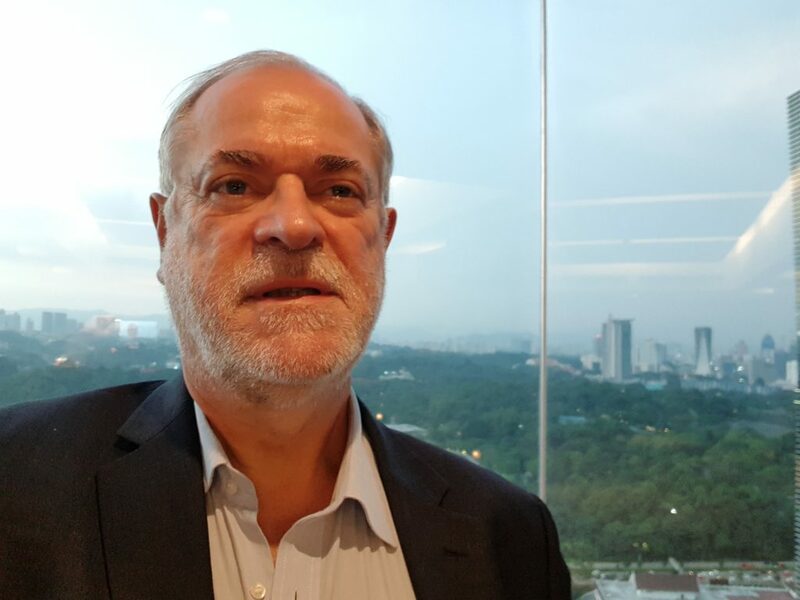 GLO President Klaus F. Zimmermann left Kuala Lumpur on March 17 to arrive in Guangzhou for the next step of his Asia tour. Final views from the hotel. Posted in Events, Media, News, Travel	| Comments Off on Farewell Kuala Lumpur: Thanks for a great visit! GLO President has left Malaysia and reached Guangzhou in China. 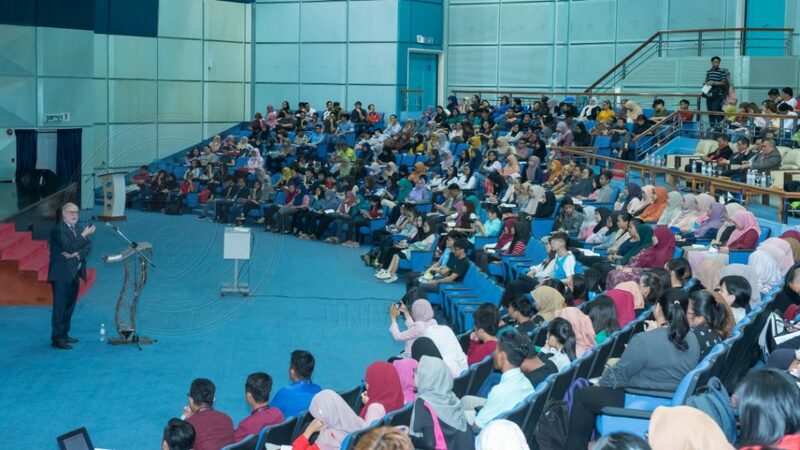 The University of Malaya expects scholars to participate in the world-wide efforts to push the research frontier with good publications in respected academic journals. 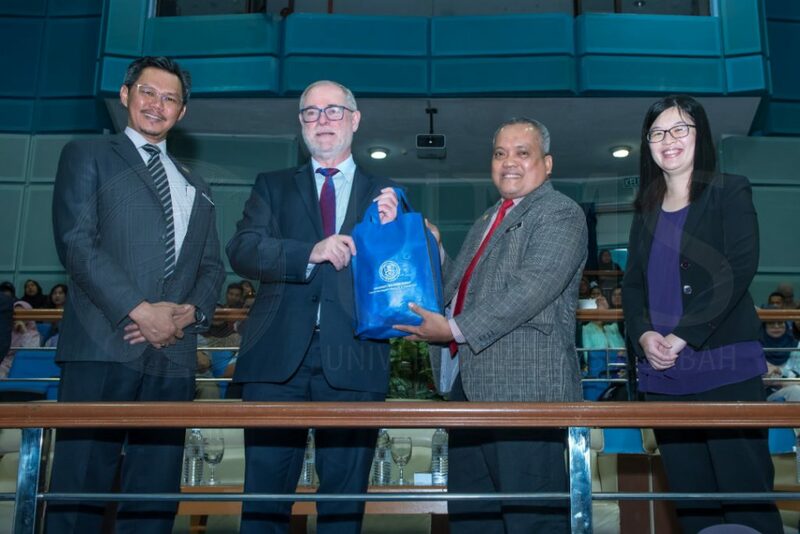 Hence, about 90 members of the university had registered for a seminar on March 15, 2019 with UM Visiting Professor Klaus F. Zimmermann (UNU-MERIT, Maastricht and GLO), who is also the Editor-in-Chief of the Journal of Population Economics, the leading outlet in that field. 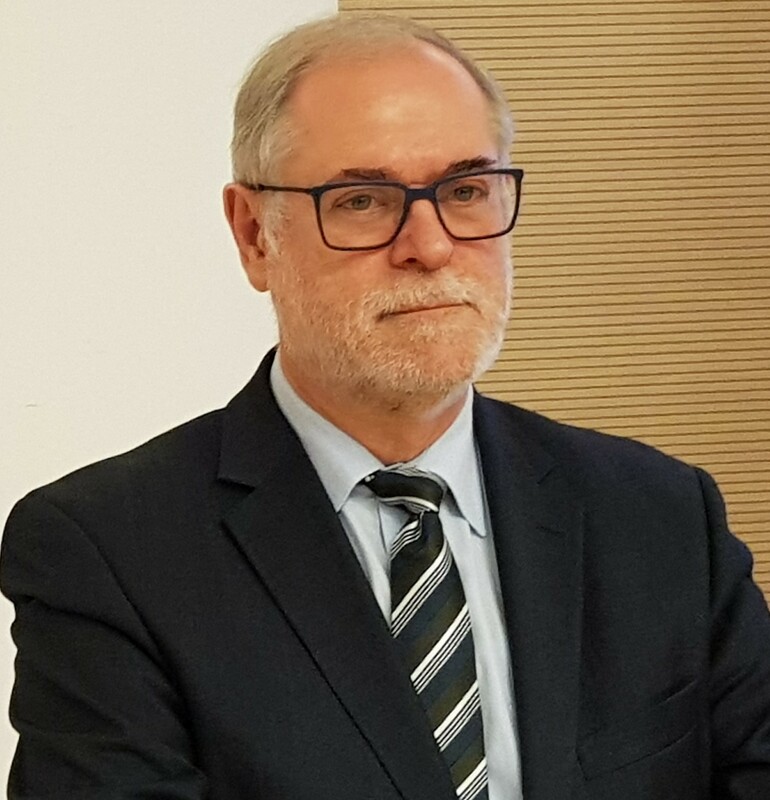 He is or has been involved as editorial board member with a few dozens of good journals and has published over 150 articles in refereed international journals. He explained the editorial process from all sides and pointed at key factors to increase the chances of publication success. The session continued by many questions of participants and the presentation of the results of a survey among the participating scholars about their interests and ambitions. The responses signaled a significant motivation of the UM scholars for the publication challenge. 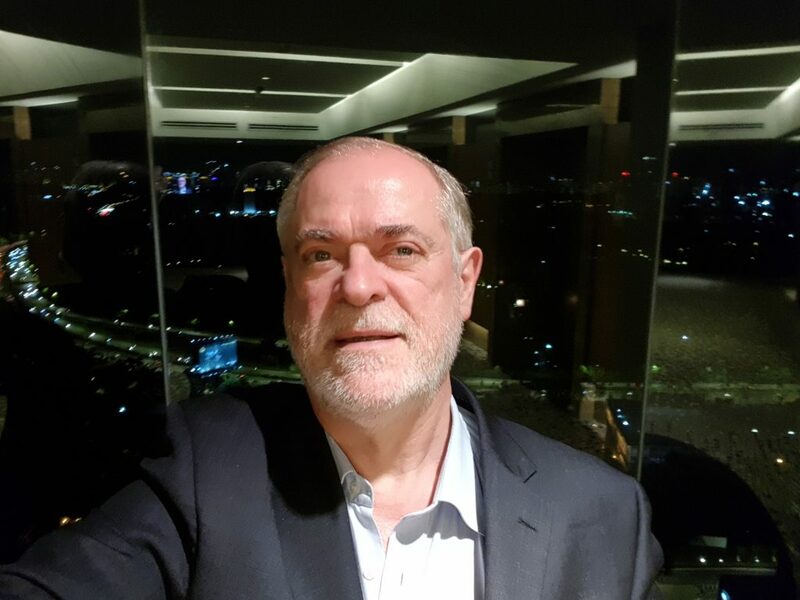 Klaus F. Zimmermann (UNU-MERIT and Maastricht University) is the President of the Global Labor Organization (GLO) and the President of the Eurasia Business and Economics Society (EBES). 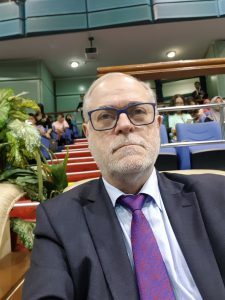 Zimmermann in his role as EBES President is the recent successor of Jonathan A. Batten, a Professor of University Utara Malaysia, who was serving in this function for many years. Batten is also a GLO Fellow. 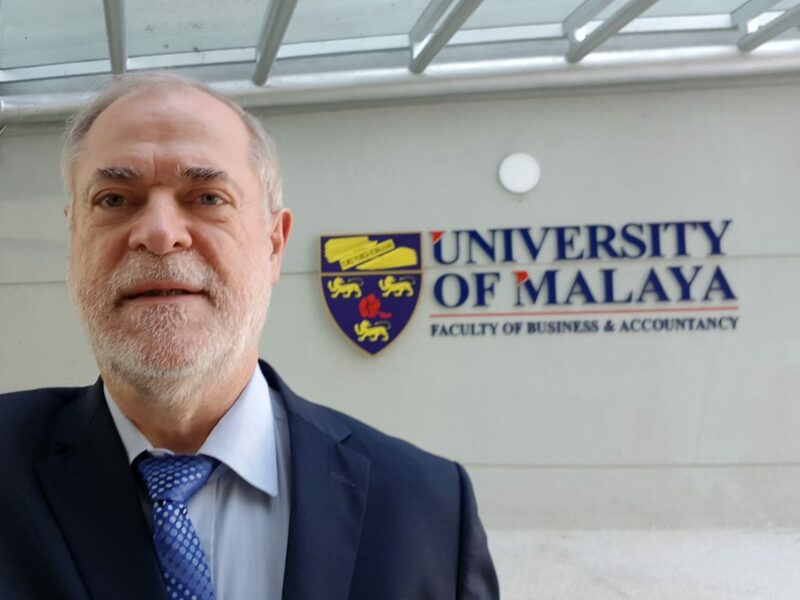 Noor Azina Ismail, a Professor of Applied Statistics of the University of Malaya, is the local contact for the 30th EBES congress, which will take place on January 8-10, 2020 at the University of Malaya, Faculty of Economics and Administration. 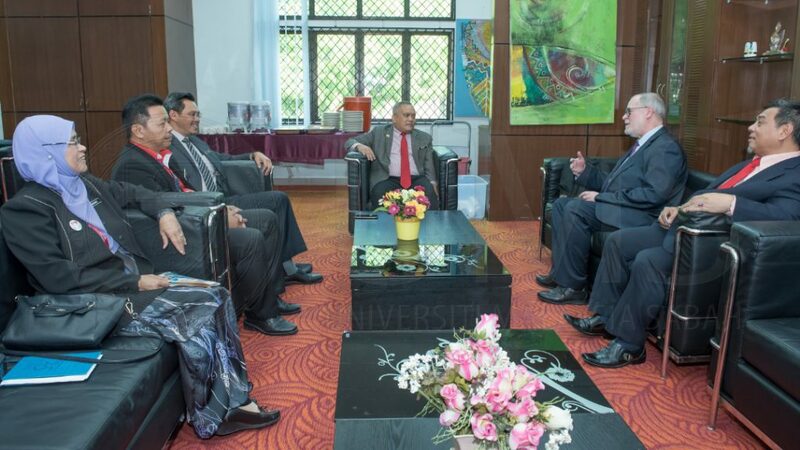 Zimmermann used his visit at UM to meet with Jonathan A. Batten for dinner and with Noor Azina Ismail for lunch to discuss EBES business issues. Klaus F. Zimmermann & Jonathan A. Batten after a joint dinner. 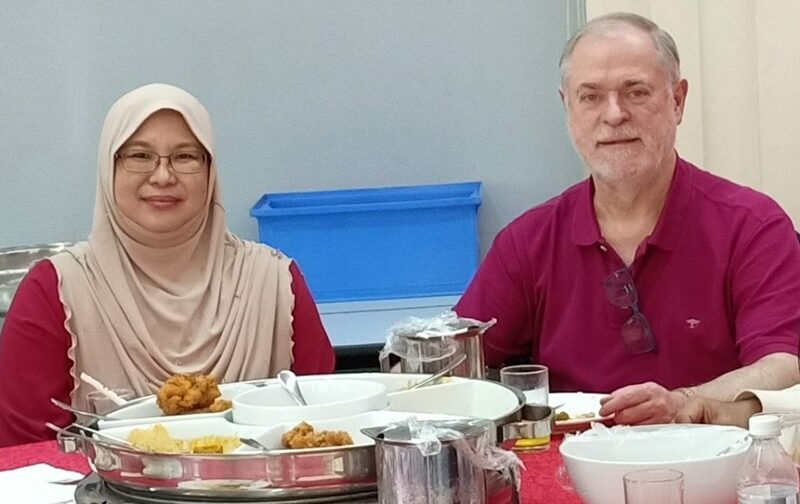 Klaus F. Zimmermann & Noor Azina Ismail after a joint lunch. March 14, 2019: Kuala Lumpur, Malaysia. University of Malaya (UM). 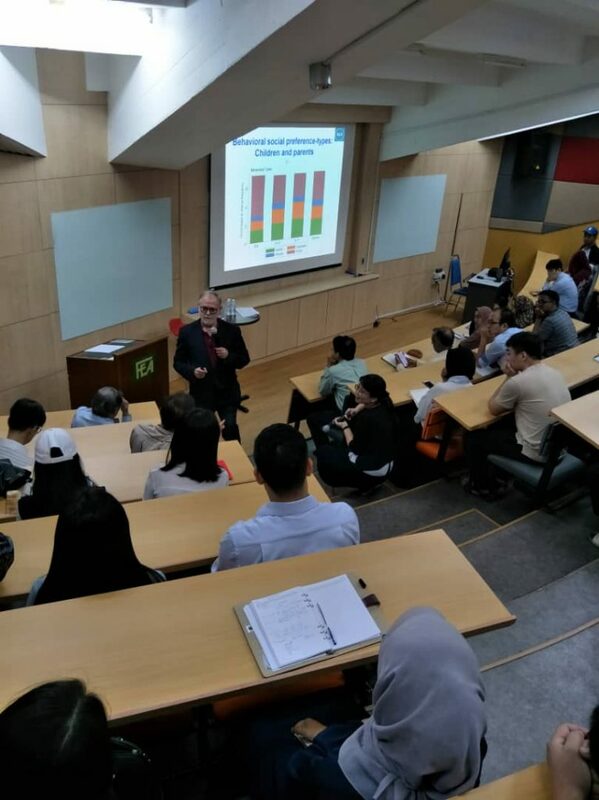 Joint UM – World Bank Research Seminar with GLO President and UM Visiting Professor Klaus F. Zimmermann on “Economic Preferences Across Generations“. 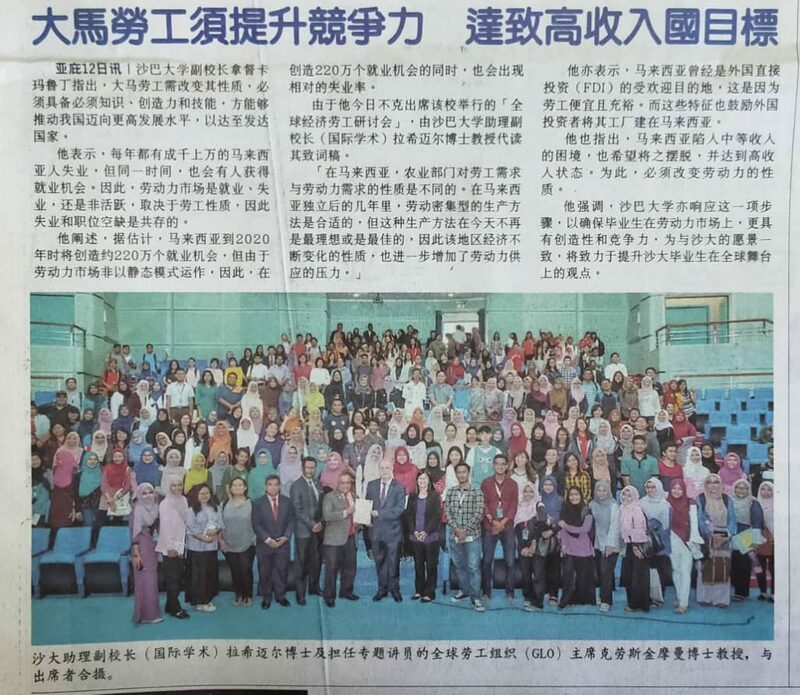 About 90 registered participants. The presentations was followed by a long, interested and intense discussion followed by joint lunch of some core participants of the World Bank and the UM Faculty. Extended abstract of “Economic preferences across generations: Identifying family clusters from a large-scale experiment”. Economic preferences – like time, risk and social preferences – have been shown to be very influential for real-life outcomes, such as educational achievements, labor market outcomes, or health status. The paper contributes to the recent literature that has examined how and when economic preferences are formed, putting particular emphasis on the role of intergenerational transmission of economic preferences within families in Bangladesh. The paper is the first to run incentivized experiments with fathers and mothers and their children by drawing on a unique dataset of 1,999 members of Bangladeshi families, including 911 children, aged 6-17 years, and 544 pairs of mothers and fathers. It finds a large degree of intergenerational persistence as the economic preferences of mothers and fathers are significantly positively related to their children’s economic preferences. Importantly, it finds that socio-economic status of a family has no explanatory power as soon as we control for parents’ economic preferences. A series of robustness checks deals with the role of older siblings, the similarity of parental preferences, and the average preferences within a child’s village. One can also classify whole families into one of two clusters with either relatively patient, risk-tolerant and pro-social members or relatively impatient, risk averse and spiteful members – and show that socio-economic background variables can explain whether a family belongs to the one or the other cluster. The presented paper is a substantial revision of GLO Discussion Paper No. 183 and available on request. 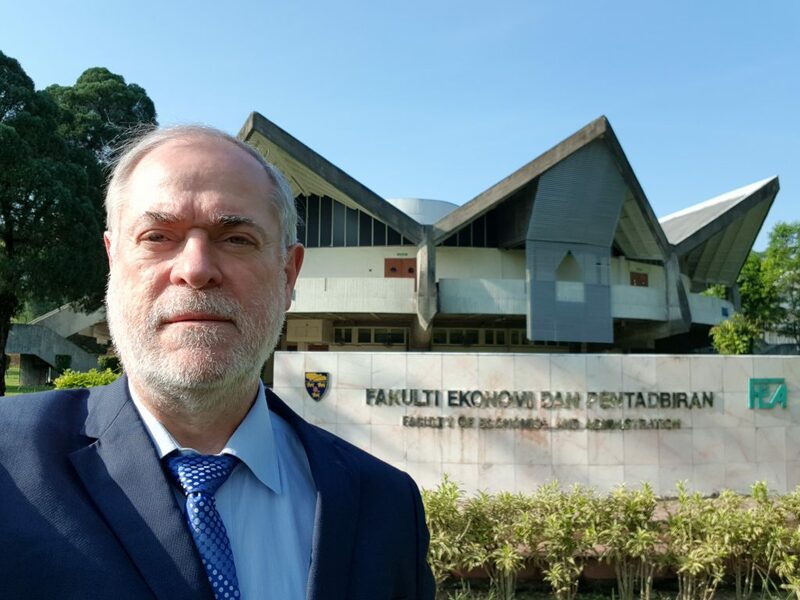 GLO President Klaus F. Zimmermann took office as Visiting Professor at University of Malaya (UM), March 10 to 17, 2019. 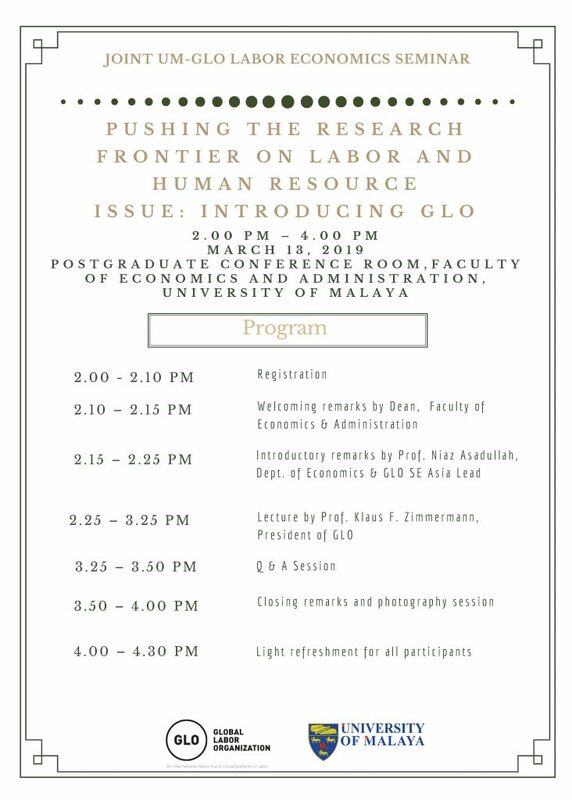 And provided a talk in the joint UM-GLO Labor Economics Seminar on March 13. 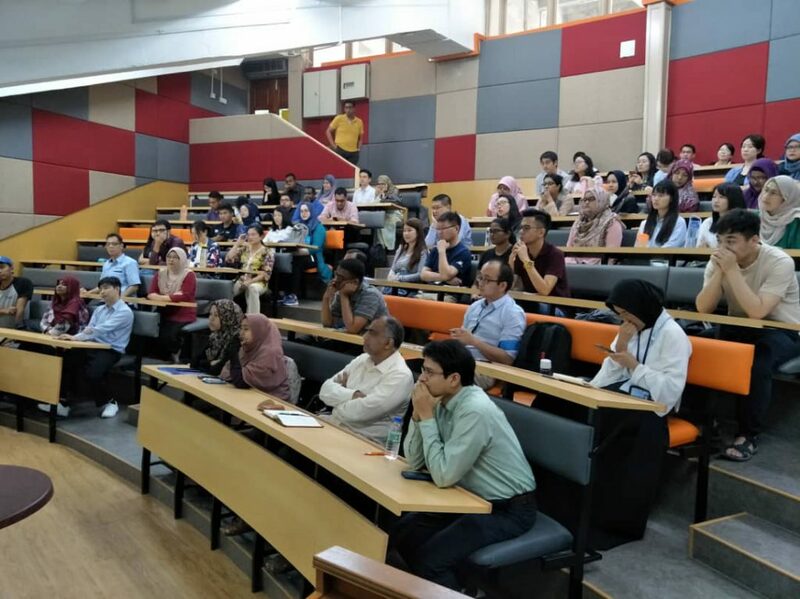 The well attended research seminar on March 13 (about 60 participants) of Zimmermann on “Pushing the Research Frontier on Labor and Human Resource Issues: Introducing the Global Labor Organization (GLO)” was introduced and chaired by the Dean of the Faculty of Economics & Administration, Prof. Rohana Binti Jani. Zimmermann stressed the importance of establishing and developing academic networks for the progress of the discipline and the needed publication success. He explained the functioning of the Global Labor Organization. The regular UM – GLO Research Seminars were established in Summer 2018. The GLO is an international, independent, non-partisan and non-governmental organization that has no institutional position. It deals with the the challenges and benefits of globalization and international collaborations and functions as a global network and virtual platform for researchers, policy makers, practitioners and the general public interested in scientific research and its policy and societal implications on global labor markets, demographic challenges and human resources. UM requires from staff regular publications in good research journals. GLO Fellow and UM Prof. M. Niaz Asadullah introduced the GLO South-East- Asia Research Cluster he is successfully leading. Zimmermann in front of his office. 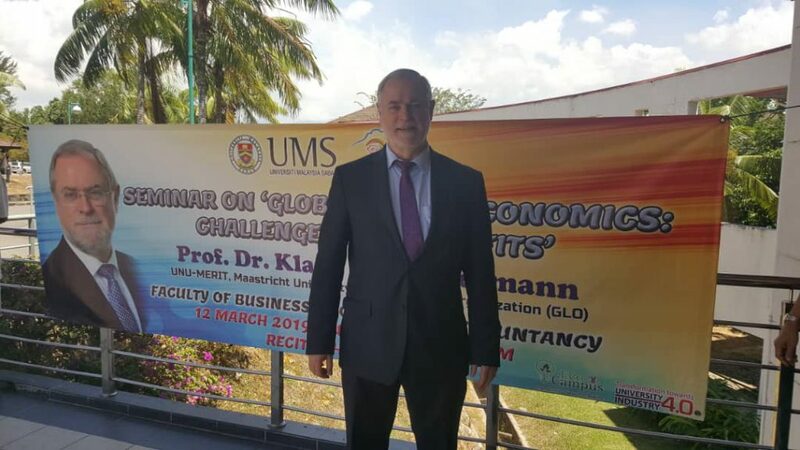 Posted in News, Politik, Travel	| Comments Off on GLO President Klaus F. Zimmermann took office as Visiting Professor at University of Malaya (UM), March 10 to 17, 2019. 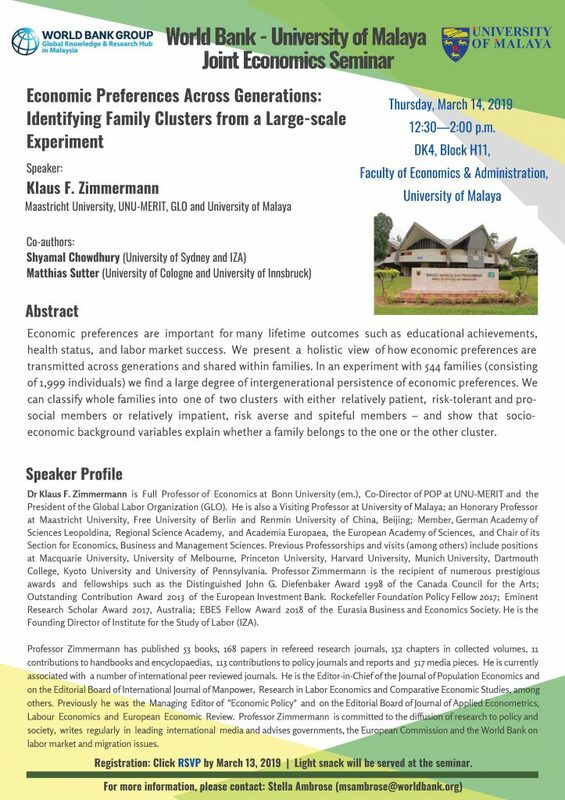 And provided a talk in the joint UM-GLO Labor Economics Seminar on March 13. March 11, 2019. Early evening in Kota Kinabalu, Island of Borneo in Malaysia. GLO President Klaus F. Zimmermann enjoyed a joint dinner with members of the Universiti Malaysia Sabah (UMS), Faculty of Business, Economics and Accountancy, in Sabah, the Northern Malaysian state on Borneo Island, including Dean & Associate Prof. Raman Noordin, his host, GLO Fellow Dr. Beatrice Lim and GLO Affiliate & Lecturer Dr. Borhan Abdullah. Beatrice Lim is also Senior Lecturer and Head of the Human Resource Economics Program of the Faculty. 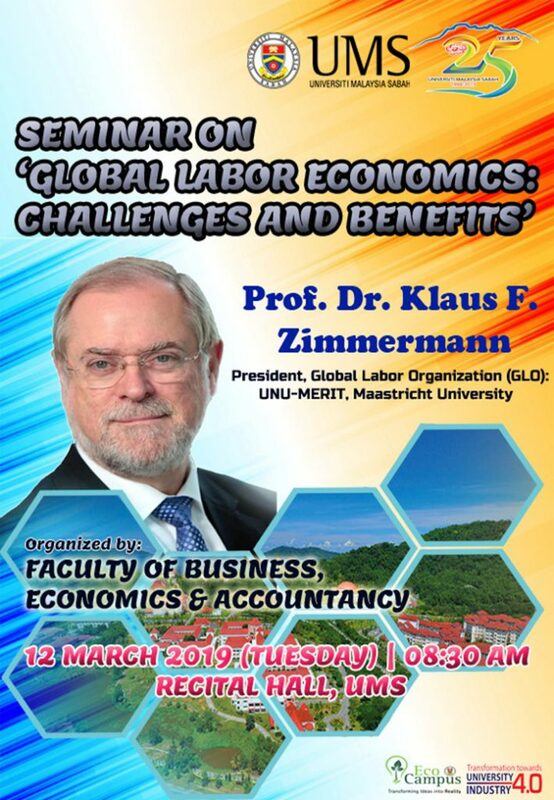 In the morning of March 12, Klaus F. Zimmermann provided the public University Silver Jubilee Lecture on “Global Labor Economics: Challenges and Benefits” and after a longer break to discuss issues with many prominent faculty members, a public Seminar on “Publishing in Good Journals”. 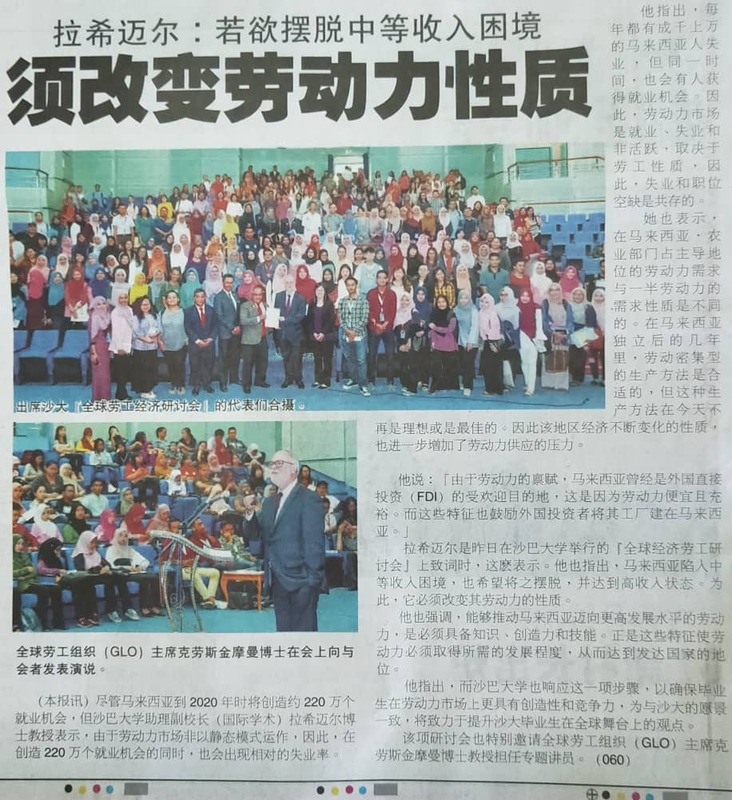 About 400 people attended the festive ceremony around the Silver Jubilee Lecture and around 40 stayed to learn and discuss about the art of publishing in good academic journals. 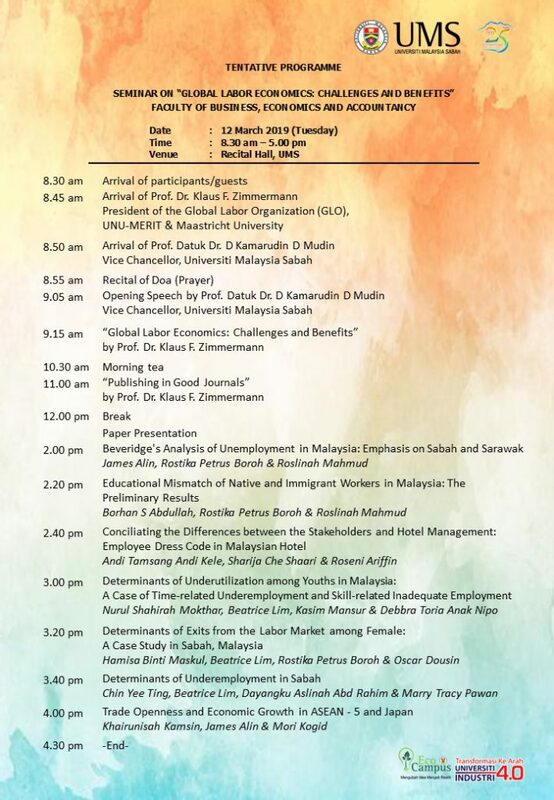 The two events were part of a day-long seminar (see below) of the Faculty of Business, Economics and Accountancy on “Global Labor Economics: Challenges and Benefits” with a series of paper presentations of local scholars in the afternoon. Walls and Fences: A Journey Through History and Economics– Download PDF by Vernon, Victoria & Zimmermann, Klaus F.
Global Labor Organization Discussion Paper No. 330. Social Cohesion and Labor Mobility – Download PDF by Zimmermann, Klaus F.
Global Labor Organization Discussion Paper No. 249. Migration for Development: From Challenges to Opportunities – Download PDF by Zimmermann, Klaus F.
Global Labor Organization Discussion Paper No. 70. March 11, 2019. Morning: Kuala Lumpur. 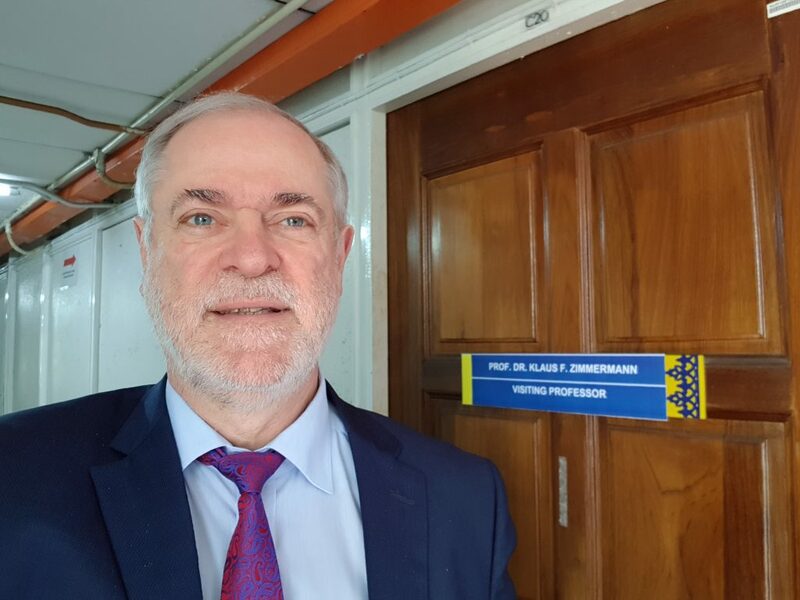 GLO President Zimmermann takes his office as a Visiting Professor at the Faculty of Economics & Administration, University of Malaya. He meets with Dean & Prof. Rohana Binti Jani and his host, GLO Fellow Prof. M. Niaz Asadullah, to discuss strategic issues. 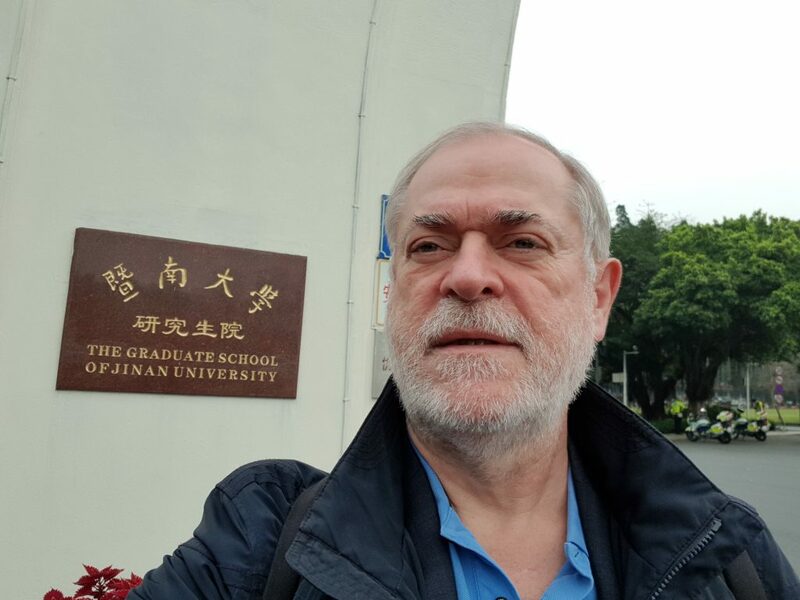 He meets also with most faculty members and staff for introductory talks about research interests and academic strategies, and enjoys a joint lunch as part of a very warm and friendly welcome. March 11, 2019. Evening: Kota Kinabalu. GLO President Zimmermann enjoys a joint dinner with members of the Universiti Malaysia Sabah (UMS), Faculty of Business, Economics and Accountancy, in Sabah, the Northern Malaysian state of Borneo Island, including Dean & Prof. Raman Noordin and his host, GLO Fellow Prof. Beatrice Lim. 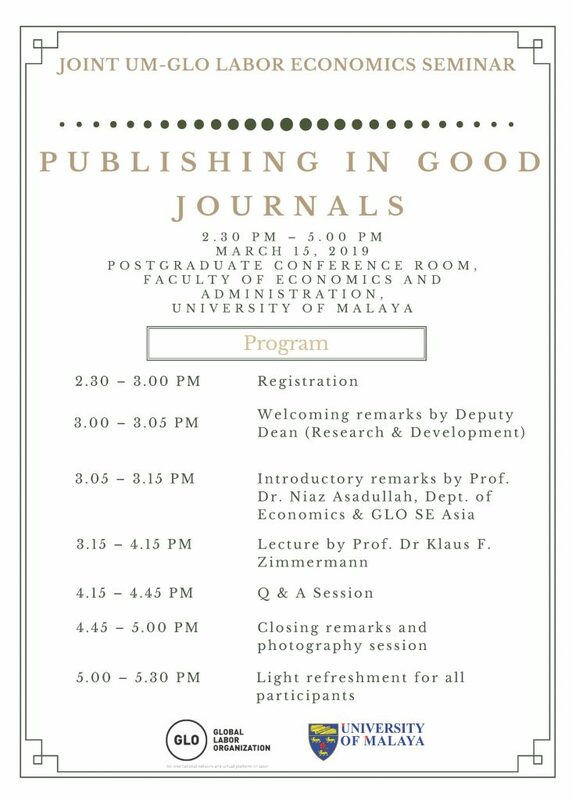 In the morning of March 12, Zimmermann will provide the public University Silver Jubilee Lecture on “Global Labor Economics: Challenges and Benefits” and a public Seminar on “Publishing in Good Journals”. 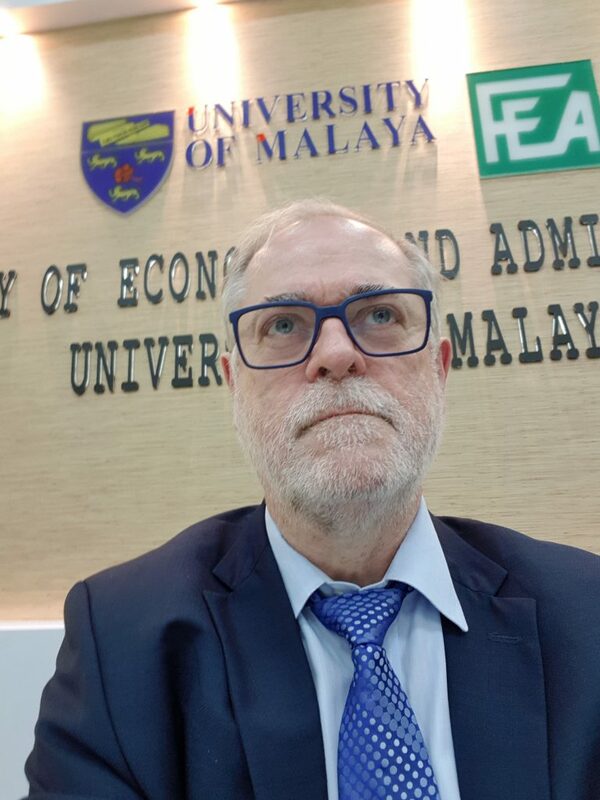 Klaus F. Zimmermann, Professor Emeritus of Bonn University, Co-Director POP at UNU-MERIT, Maastricht, and Honorary Professor Maastricht University, has been appointed Visiting Professor at the Faculty of Economics & Administration of the University of Malaya (UM). 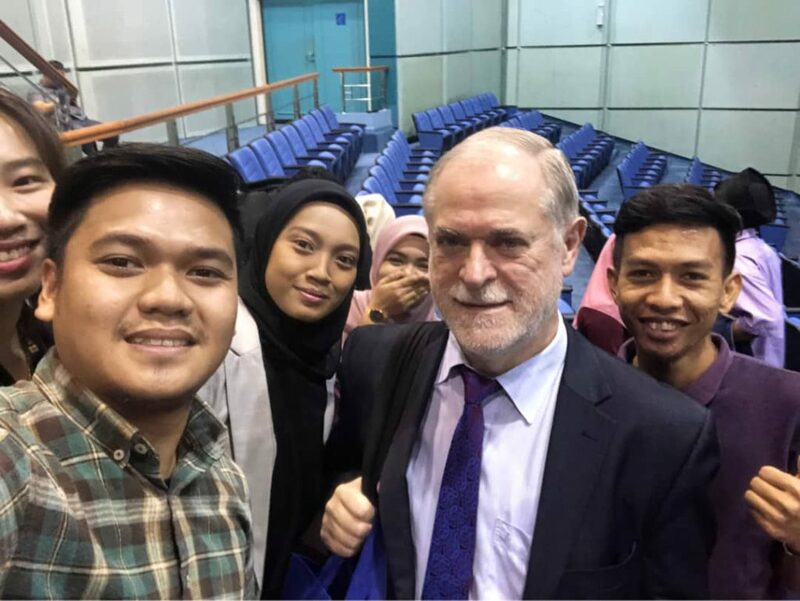 He has left Frankfurt/Germany on March 9 to reach Kuala Lumpur on March 10 to discuss research issues with GLO Fellow M. Niaz Asadullah, (UM), who is also the GLO South-East Asia Research Cluster Lead. It is the beginning of a lecture tour through South-East Asia. Enjoying the pool with 35° C and sunshine after the longer travel.